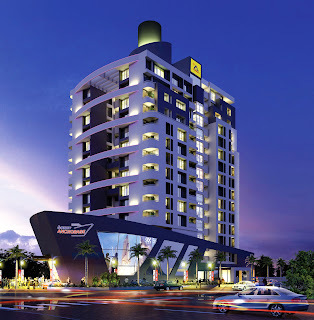 Thrissur, August 16, 2013: Asset Homes, one of the largest real estate companies in Kerala, announced its new luxury apartment project in Thrissur. “The construction of the 14-floored luxury apartment, Asset Anchorage, located in the centre of the city, on Avenue Road, will be completed and handed over within 2 years,” Mr. V. Sunilkumar, Managing Director and Mr. K. Anil Varma, Executive Director told a media conference here. “The project offers a choice of 48 exclusively designed, spacious 4 bedroom apartments and 3 bedroom apartments with areas ranging from 2000 square feet to 3400 square feet. The most attractive feature of this exclusive ship-shaped project is the stunning swimming pool and party area constructed in its deck region. The apartments will be available in the price range of Rs.75 lakhs to Rs. 140 lakhs,” said Sunil Kumar. Asset Anchorage is the second project of Asset Homes in Thrissur. “We are also glad to announce that our ongoing project, Asset Midtown in Poonkunnam, will be completed and handed over in this December,” informed Sunil Kumar. This luxury apartment will be constructed using the most modern technologies available in the industry. This will be the first-of-its-kind project in the city to do so, added Anil Varma. “Asset Homes is one of the few builders in India who do not depend on outsourcing to build. As we have our team and equipment to do our jobs, we could always maintain the quality standards of construction and deliveries on time,” said Anil Varma..
Having completed 26 projects in a short span 6 years, Asset Homes steadily continues its successful run in the realty development with 21 ongoing projects in Kochi, Thiruvanathapuram, Kottayam, Kannur and Thrissur. Founded in 2007, Asset Homes is known for its professional leadership under the Chairmanship of Mr. K. A. Mohamed Saleem, a professional with more than two decades of top management experience in corporate companies, Mr. Sunil Kumar V., Managing Director and Mr. Anil Varma Executive Director, both civil engineering graduates with more than two decades of experience in construction and project management. Asset Homes has a team of 160 professionals working for the company and a network of 5 offices across Kerala. Asset Homes is renowned for high end luxury apartments, villas, sky villas, luxury, lifestyle and moderately priced apartments and townhouses. The company takes extra care to build eco-friendly buildings by adopting sustainable construction methods and offering high safety standards. Asset Homes has bagged prestigious awards like ‘The Excellence in Real Estate 2013’ award instituted by the British South India Chamber of Commerce, International Property Awards instituted by Bloomberg Television 2011, CNBC Awaaz CRISIL CREDAI Real Estate Awards 2010 for India’s Most Innovative Project, Realty Excellence Awards 2011 for India’s Young Achiever of the Year and Vocational Excellence Award 2009‐2010 among others. Asset Homes is the first builder to complete a CRISIL 7 star rated project in Kerala, awarded to Asset Signature, Thiruvanathapuram.